If dining and Disney are both on your to-do list, we have news for you! 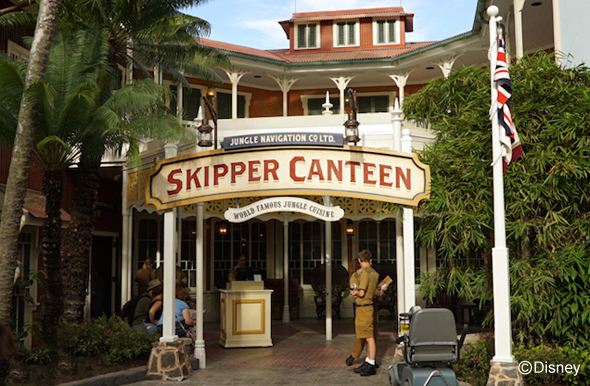 A new restaurant has started its soft opening and is officially open at Magic Kingdom this week, The Jungle Navigation Co. Ltd. Skipper Canteen, located near the Jungle Cruise Attraction. The menu will feature an array of flavors that are inspired by the flavors of the rivers found on the Jungle Cruise. These flavors include Asian, South American and African cuisine. Like the Jungle Cruise, there is a wise-cracking staff on hand. Among the choices are arepas, grilled steak, farm-raised shrimp and a rice noodle bowl. A chocolate cake (with carmelized bananas and cashew ice cream) is called Kungaloosh, a nod to the old explorer-themed Adventurers Club at Downtown Disney. Specialty drinks include the Punch Line Punch (tropical fruit juice and mango puree) and the Schweitzer Slush (frozen apple juice and passion fruit topped with green apple boba balls). They are non-alcoholic. The 222-seat restaurant is broken into three seating areas: a mess hall, a jungle-inspired parlor and a hidden meeting room of the Society of Explorers and Adventurers.